Hotel Update: The Biltmore has sold out. You can still check the registration link below in case rooms opened up. However, the Embassy Suites is located a few miles from the Biltmore and has availability for a resonsable rate. Please contact Bernadette (beaton@telestrategies.com) for details. 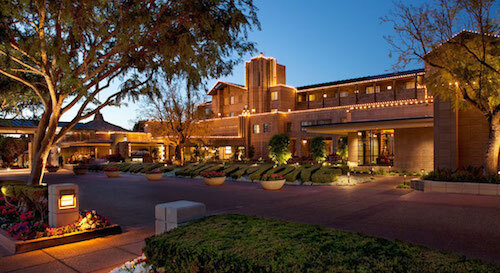 TeleStrategies is pleased to host Communications Taxation 2019 at the Arizona Biltmore Hotel - an iconic Phoenix/Scottsdale resort designed by Frank Lloyd Wright in 1929. TeleStrategies Communications Taxation attendees receive the discounted rate of $259 per night. (Note that this rate includes the $29/night resort fee.) Please make your reservation early since this rate is subject to our room block availability. The Arizona Biltmore has been an Arizona landmark since opening in 1929, when it was crowned the “Jewel of the Desert.” The legendary Grand Dame remains one of the most recognized resorts in the world for its distinctive Frank Lloyd Wright architectural style, luxurious facilities, and storied history as a playground of the rich and famous. Nestled on 39 acres at the foot of the Phoenix Mountain Preserve, the legendary resort offers 740 guest accommodations; a 22,000-square-foot spa offering an extensive menu of natural healing treatments and restorative therapies; a fitness center with state-of-the-art equipment; eight swimming pools including the spectacular Paradise Pool with its a 92-foot-long water slide; two 18-hole golf courses; and six restaurants and lounges, including the stylish Wright Bar with patio fire pits and views of majestic Squaw Peak. Splash in the Catalina Pool, a favorite of Marilyn Monroe's, or golf where Clark Gable once lost his wedding ring. Challenge your family to a game of life-sized lawn chess, a Biltmore tradition since 1929. Rejuvenate in the full-service spa and salon which feature organic treatments inspired by local culture. Relax by one of eight sparkling pools, including the renowned Paradise Pool with a 92-foot waterslide and swim-up bar. The Arizona Biltmore is a Waldorf Astoria Resort.